DUP MLA George Robinson has criticised the proposed name change of the City of Londonderry as “divisive” and “insensitive”. In a statement to the Times, Mr Robinson said: ““The insensitivity of Sinn Fein towards the Unionist people of the City of Londonderry has again been demonstrated with their latest attempt to change the name of Londonderry. 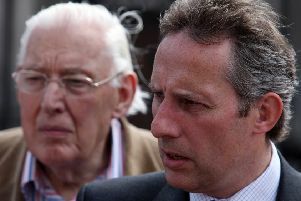 The Assemblyman said Sinn Fein should be concentrating their efforts on the economy. “It is a source of amazement to me that when £2 million a week is wasted because of Sinn Fein’s failure to grasp the current financial position that they find the time to concentrate on changing the name of Londonderry which can only be done via legislation which requires passage through the Privy Council and Royal Assent. “It is worthy of note that the DUP has representation on the Privy Council and that the abstentionist Sinn Fein have none. “It is obvious that the proposed name change is purely aimed at getting people to ignore the financial crisis and Sinn Fein’s failure to agree to the most generous welfare package in the United Kingdom. “As Sinn Fein continually shout for equality and respect it is about time they demonstrated that they actually believe what they are saying by treating the Unionist community with respect and as equals”.